100% cotton makes for a strong and safe buffing cloth! Griot’s Garage 100% Cotton Buffing Cloths are designed along the same vein as the original buffing and polishing towels in the car care industry. 100% cotton towels are strong enough to withstand extended buffing sessions, but soft enough that they won’t scratch your paint. Griot’s Garage 100% Cotton Buffing Cloths are very versatile in that they will work on just about any surface! Before microfiber was introduced to the car care market, the go-to fabric for buffing and polishing was 100% cotton. Many people would even use old t-shirts! 100% cotton fabrics are strong, durable, and last longer than your average car wax! Griot’s Garage 100% Cotton Buffing Cloths are no exception to this. Griot's Garage 100% Cotton Buffing Cloths is ideal for use with polishes and compounds where a thick fluffy nap is not necessary. Unfortunately more often than not, the tag you see that reads 100% cotton, usually contains more than just cotton. Number one additive? Polyester. Polyester is rough on paint and has been known to cause more than a few scratches in it’s time. Griot’s Garage 100% Buffing Cloths are unique in that every single thread used in the construction of these cloths is 100% cotton. Even the stitching around the outside of the towel (stops the cloths from fraying) is 100% cotton! 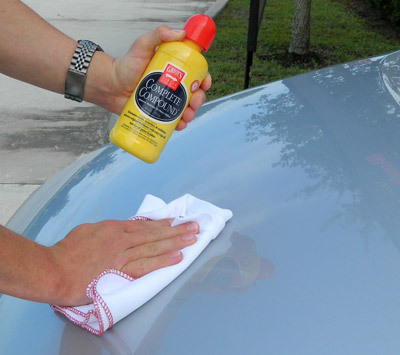 Griot’s Garage 100% Buffing Cloths have more uses than just polishing and buffing your car’s paint. They’re also great for all types of kitchen and bathroom cleaning, dusting, cleaning clear plastic, leather and vinyl wipedowns, and so much more! When you’re looking for a genuine cotton towel, Griot’s Garage 100% Cotton Polishing Cloths are the best choice. Griots Garage Complete Compound 16 oz. Griots Garage Spray-On Wax 35 oz.